Oh my goodness!! I could not believe it has been a whole month since I have written something. I guess I have been trying to get things done and taking pictures has become a thing of the past lately. But I am going to try and be better so I can keep everyone posted. I didn't take any pictures during Thanksgiving, but of course we spent the time with my parents and my brother and his family. We had to have both ham and turkey because there are a couple of men (I won't name names) that hate turkey. We ate a lot and had so much fun. Then on Friday my mom and I braved the stores for black Friday. We had so much fun and I actually got all of Santa's list done. With three kids I had a whole basket full when I left walmart. This is the one time of the year that it feels good to spend money on the kids. I am so excited for Christmas. Now I am just trying to get the house situated. 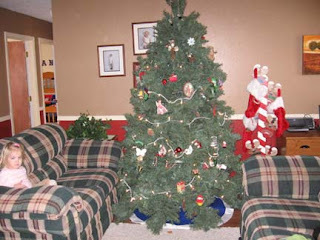 Here are some pictures of our Christmas tree. I know that it looks bare, but we got this tree last year from someone and it is a lot bigger than our last one. So I will have to work on getting more tree trimmings as the years go by. The kids love it and always have to have the lights on. 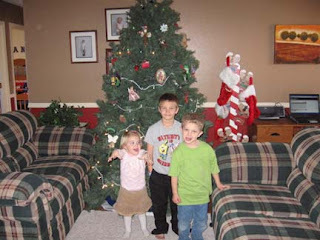 When we had gotten all the ornaments on the tree Lexie points to one and tells me it is her. 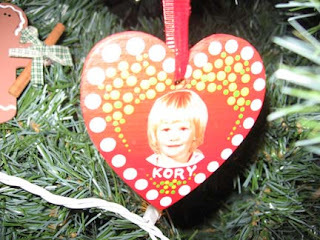 I look and it is an old ornament my mother gave me when I got married with my picture on it when I was her age. We do look a lot alike. So I couldn't help but take a picture to compare. I can't believe how much you looked like your own daughter. That's amazing. Your family is so adorable. I'm glad you had such a great holiday. Glad the holiday was fun... I have most of my shopping done, but not all, so I am VERY impressed!!! 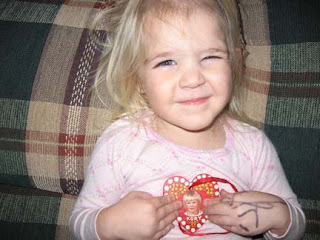 You and Lexie could have been twin sisters. You look like you had quite a bit of hair at such a young age!! Well, I will talk to you later.. Love ya!